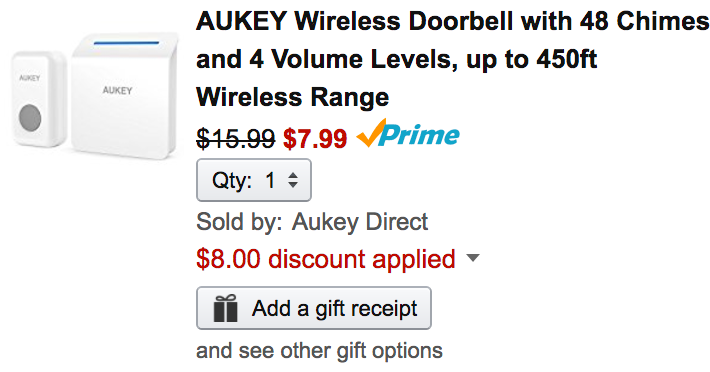 Aukey Direct (100% positive customer feedback) via Amazon offers its 450 foot wireless range doorbell for $15.99, but if you use the code AUKEYSTD the price drops to just $7.99 Prime shipped. That’s half off the already low sale price and the lowest we’ve seen for it at Amazon. This doorbell has a 450 foot operating range, 48 unique chimes to choose from and it’s IP44 dust and water resistant to endure all kinds of weather. Rated 4/5 stars by Amazon shoppers. Don’t miss a delivery or a visitor again. Hear your doorbell loud and clear from the basement, garage, or attic. The AUKEY Wireless Doorbell has a wireless range of over 450 feet giving you more flexibility to find an ideal location for the receiver unit in your home or office. Choose from over 48 different chimes and adjust chime volume to your preference. And yes, it’s unbelievably easy to install. 24 Month Warranty Whether it’s your first AUKEY purchase or you’re back for more, rest assured that we’re in this together: All AUKEY products are backed by our 24 Month Product Warranty.